Welcome to my December 2015 Monthly Income Report! As always, I post a monthly report that details the ins and outs of my business, from the lessons learned to the dollars earned, and exactly where it all comes from. You’re always free to go back in time and check out my earlier reports, which I’ve been publishing since October 2008 when I started monetizing my online businesses, but if you’re all caught up let’s continue with this month’s report. December is always a super crazy month, but this time around it was especially crazy. It’s always nuts because there are a lot of family functions that happen at this time of year, but with my upcoming book launching on February 1 and a deadline to complete the manuscript, I was constantly doing something and never had any time to relax. It’s all good, though. I enjoy the work and like I say on my podcast, it’s about working hard now, so you can reap the benefits later. My son’s birthday is the day before Christmas, and because he’s in school now (and his birthday is on Christmas break), we decided to throw a party at our home for his school friends, which added more to our plate but was entirely worth it. With family functions, the birthday party, and my book deadline, it was a busy a month! My son is very into Star Wars, and he was even into it before Episode 7: The Force Awakens was announced. Definitely a mini-me. We all dressed up for the occasion and my wife spent half a day creating lightsabers for everyone. 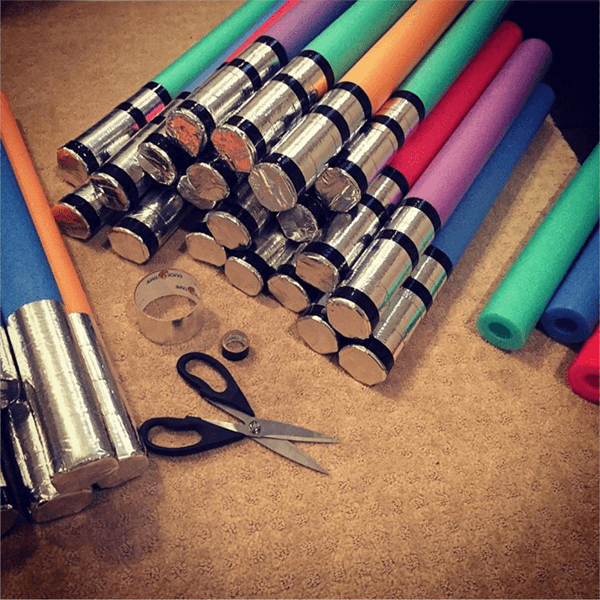 They were kid-friendly and made of pool noodles with shiny duct tape on the end to be the handle. My wife rocks! Unfortunately, right after all of the birthday and Christmas celebrations, all of us in the house got sick. I lost my voice, which wasn’t good at all because, well, I’m a podcaster. I had planned to batch process a number of AskPat episodes before the new year began, but that wasn’t even close to happening. I spent a good majority of the first few days of the year catching up, since I wanted to stay ahead of schedule like I have been to make room in my schedule (and in my head) for the upcoming book launch. We’re all good now, and I’m thankful we’re back to full health and I’m caught up on most of my work. Many of you already know who Chalene Johnson is. I spoke at her event, Smart Success Summit last March and I was completely blown away by how how amazing her audience is. I had a blast on stage, and learned what it truly meant to have raving fans, because Chalene’s “Lifers,” as she calls them, are exactly that. I mean, I know I have some amazing fans of SPI (and it’s true, you are amazing!) but when I witnessed the kind of relationship Chalene has built with her Lifers, it was truly inspiring and really fun to watch in person. It was like nothing I had ever seen before. If you’d like to hear Chalene talk about how she’s built up such an amazing fan-base, check out Session 167 of the SPI Podcast where she was our featured guest. If you’d like to see for yourself just what kind of fan base she has, catch her live on her next Periscope stream. Get in early though when she’s live, because I’ve seen more than one thousand people jump into the stream within the first minute. Speaking of Periscope, it was on one particular scope that she gave me the birthday surprise of a lifetime. My thirty-third birthday was on the December 6, and I was invited to meet Chalene and her family a few days later to record a couple of podcast episodes and film a Periscope session or two. Before any of that though, she said that I’d have to first spend the morning working out with her and her team. Yes—like, physical workouts. Sweat. And not just one workout, but two. She’s a fitness celebrity, so of course I had to say yes. And of course, I was wrong. This was so much better than any cycling I’ve ever done before. It’s hard to explain, but you can check out this video to immediately get a feel for what I experienced. Did you catch that beat drop at the thirty-second mark? It was that kind of stuff for an hour, and I loved every second of it and I would not at all hesitate to do this again. Big shout out and thank you to the entire Grit Cycle team for letting me crash and experience that! After that, it was back to Chalene’s house for a PiYo workout. 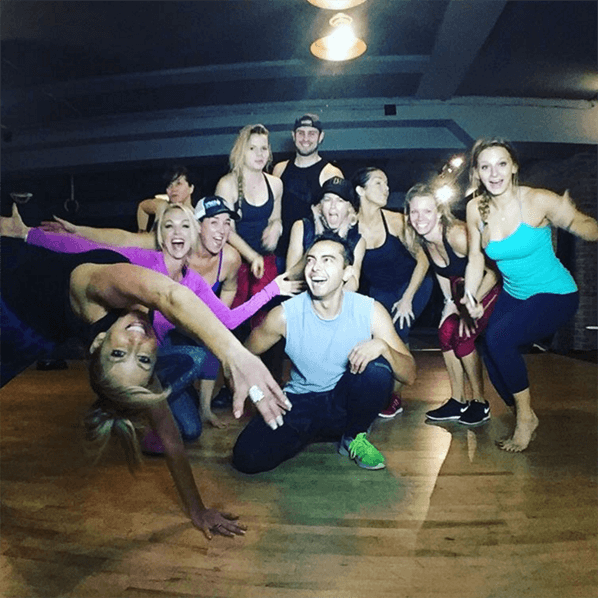 PiYo is one of Chalene’s fitness programs. She and her team were there, and I was hanging in there for about forty-five minutes! It was tough, but it felt great. And yes—the next day I was sore in places I’ve never been sore before, LOL. After that it was a healthy lunch and a shake, and then Chalene and I sat down to film a couple Periscope sessions. I knew I would be sharing information about affiliate marketing with her audience to help them out, but before that she went live with a different one that turned out to be a scope where she would reveal a birthday surprise to me, and I absolutely had no idea about it. I recorded a replay of that scope for you to watch in case you’re interested (embedded below). Chalene remembered that in 2014 for my birthday instead of asking for gifts I asked the SPI community to get involved with building a school in Ghana through Pencils of Promise. Together we raised more than $50,000 and built two schools, and I actually went to Ghana in June to visit the schools we built together, and I met the students and teachers, too. An amazing, life-changing trip for sure. Well, Chalene decided to help out and add to my support for Pencils of Promise in a way that was completely unexpected. First, she blocked me on Periscope so I wouldn’t know any of this was going on, and twenty-four hours before I was sitting with her on that couch she got on and through Periscope alone rallied her Lifers to help support Pencils of Promise and contribute anything they could to the build of another school on my behalf. After it was all said and done, more than $20,000 was raised through the generosity and support of her Periscope community (yes, just from a Periscope! ), and Pencils of Promise had nearly enough money to build another entire school! Just so you know, this has a potential future impact of helping three–four thousand students in a single community over its lifetime! When she revealed this to me live on camera, I was blown away. I was brought to tears from all this and I just wanted to take a moment here in this report to publicly thank Chalene and her community of Lifers for their support for Pencils of Promise. It was such a cool gift to receive, and it’s all about the children whose lives it will impact. Thank you, Chalene, you’re such an amazing person and I’m so proud and honored to call you my friend! For the last several months, my upcoming book, Will It Fly? How to Test Your Next Business Idea So You Don’t Waste Your Time and Money has been my “one thing”—the only work-related priority item that has been on my mind. December was all about putting the finishing touches on the manuscript, and with the help of an amazing content editor (Thanks, Ann! Check her out at Command+Z Content), I was able to dust off my hands and feel the amazing relief that comes with finishing a large-scale project such as this. Of course, that relief was very short-lived because as soon as the manuscript was done the team and myself shifted into marketing mode. Plus, there’s all this other stuff that comes along with publishing books that I’m not very familiar with because this is my first time in a long time going through this process. There’s the design, both of the cover and the interior of the book, as well as the conversion into all of the proper file formats for digital distribution. Additionally, I’ve been on a massive podcast guest tour as of late, trying to schedule and have the opportunity to talk about the book and be in as many places at once when the book drops on February 1. I’m extremely excited to see what happens, but I’m also really nervous too. I care so much about delivering value to my audience that I always experience this kind of fear before any big undertakings like this I’ve taken in the past—from starting my business to selling other products, and even getting into podcasting and public speaking too. What if everyone hates it? What if it becomes the laughing stock of all entrepreneurial books? What if it completely ruins my reputation as a leader in this space? When I truly think about these questions, I know that they’re silly to even consider. Even if it does poorly, what’s the worst that can happen? Probably not any of the above. I can always bounce back with something better. But still, my mind always does this to me before launching something big, and so I know it’s a sign that I’m on the right track. Every amazing moment in my business has been preceded by an incredible amount of fear, and this book is no exception. Because of that, I know I’m taking the bold actions needed to make sure I deliver the best value that I can. I’d be worried if I wasn’t worried, because that probably means I didn’t put enough into it. My biggest worry when I started writing this book a year ago was that I’d be selling something that I didn’t believe in. I’m happy to say that I’m 100 percent confident and incredibly proud of what I’ve done. I consider it my best writing, and so it makes it really easy to talk about, get behind it and sell it like I mean it—because I do. I hope you’ll join me in celebrating the launch of Will It Fly? on February 1. I’ll be throwing a little launch party, which you’ll hear more information about very soon. Just head on over to WillItFlyBook.com to sign up and make sure you get notified when everything happens. Pre-orders will be available very soon! Will It Fly? Well, we’ll see. All right, let’s get to this month’s income breakdown. Pressure is more than just a deadline. With the deadline of the manuscript creeping in faster and faster each day, I realized just how much the time crunch got my head in the right place to really focus and get my work done. If something I was doing wasn’t related to the book or my family, I shouldn’t be doing it. It was very clear during that final two weeks before the manuscript was due what my tasks were, and as such, I was able to get things done and on time. As I think back to my past and other jobs that I’ve held, I really did thrive when there were deadlines. In architecture, for example, we had to get specific drawings done in time or meet certain project milestones for the client. I worked extremely well and efficiently in that environment, that is, of course, until I got let go in 2008. I’ve tried setting deadlines for other things in the past and sometimes they work, and sometimes they don’t, and it wasn’t until this month that I finally figured out what the difference was. I know I work well under pressure, but it’s not the deadline that creates that pressure. It’s the consequence of what happens if that deadline is not met. That’s what gets me to move, and that’s the problem with setting your own deadlines. With the manuscript, my entire team was waiting for me to finish before moving into the next phase of the production of this book. If I didn’t meet the deadline and finish my manuscript, the entire production cycle would be delayed, and we either launch later than expected, or my team works way more than they should to get things done on time. Knowing my team, they would do whatever it takes and I couldn’t imagine doing that to them. With architecture, it wasn’t about the deadline, it was about losing a potential client if things were done on time and within the budget. When you create a deadline for yourself, it’s also important to think about the consequence that comes with it. What will you really lose, or what will happen if you don’t do what you need to do by that certain time? And if you find there isn’t any consequence on the other end, that’s when deadlines get pushed back without regret, and projects never get finished. How do we create a consequence (that goes along with the deadlines we create) that will ensure that we do what we need to do by the time we need to do it? All I know is that it has to be real and it has to be great. It can’t be a slap on the wrist, for example. How do we define this? What’s the process like? I love talking about productivity and self-optimization. What about you? Cheers, thanks so much for your support, and here’s to an amazing 2016!